The automatic control method for air conditioner comprises the first step that memorize the sensed outside temp to the memory of micro computer, the second step that compares the sensed temp. with the memorized temp., the third step that determines the change of outside temperature based on the compared temp. at the second step, the fourth step that determines whether the range of temp. change is between the memorized outside temp. or not, the fifth step that performs dehumidification operation by the control of micro-computer after compensating relative humidity when the determined temp. change is acceptable, the sixth step that senses the outside temp. to prevent the freezing of indoor heat exchanger, and the seventh step that returns to the normal operation when the outdoor temp. and dehumidification operation time is coincident to the basic data of the computer. 제 1 도는 일반적인 습도센서의 감지 그래프. The general detection graph of the humidity sensor 1 turn. 제 2 도는 본 발명이 적용되는 분리형 에어 컨디셔너의 전체적인 개략도. A second turning overall schematic diagram of a separate type air conditioner to which the present invention is applied. 제 3 도는 본 발명을 구형하기 위한 제어 시스템도. The third turning a control system for the present invention spherical. 제 4 도는 습도 및 실외온도의 대비 그래프. The fourth graph of contrast turning humidity and outdoor temperature. 제 5 도는 본 발명의 동작순서를 도시한 플로우챠트. A fifth flowchart illustrating an operation procedure of the invention leads. 본 발명은 분리형 에어컨디셔너에 관한 것으로써 특히, 마이크로컴퓨터를 이용하여 실내의 온도 및 습도를 최적화 시킬 수 있는 분리형 에너 컨디셔너의 자동제어 방법에 관한 것이다. The present invention relates to an automatic control method for writing to a removable energy conditioner which can in particular, by using a microcomputer optimizing the temperature and the humidity in the room for a removable air-conditioner. 일반적으로 습도가 높을 경우에는 덥고, 낮은 경우에는 시원하게 느껴지며, 또한 기온이 낮고 습도가 높으면 에어컨디셔너의 냉방 운전율이 저하함과 동시에 습도가 높은 그대로의 상태로 안정되어 더이상 낮아지지 아니한다. Hot, usually at higher humidity and there becomes cool if you feel low, and low humidity, the temperature is stabilized in a state of high rate and at the same time the cooling operation of the air conditioner decreases the humidity high as it does not decrease any more. 이러한 경우, 실내 거주자가 시원함을 느끼기 위해서는 거주자 자신이 수동으로 제습운전 또는 냉방 제습자동변환 운전으로 변화시켜서 습도를 낮추어야 한다. In this case, the order for the residents to feel the coolness indoors by their occupants to manually change the dehumidifying operation or the cooling and dehumidifying operation automatically converts lower the humidity. 그러나, 일반적으로 에어컨디셔너에 사용되는 습도센서의 경우 제 1 도에 도시한 바와같이 실내습도가 80% 이상이 될 때의 습도 변화폭과 실내 습도가 30% 이하가 될 때의 습도변화폭은 정확하게 감지 하기가 곤란하므로 거주자 자신이 느끼는 체감습도에 의해 수동으로 제습운전 또는 냉방제습자동 변환운전으로 교체할 경우에는 제습효율이 저할될 수 밖에 없다는 문제점이 있었다. In general, however, the case of the humidity sensor used in the air conditioner and humidity variation range when the humidity variation and the indoor humidity when the indoor humidity as shown in FIG. 1 will be not less than 80% to be 30% or less is that to accurately detect If you are so difficult to manually replace the dehumidification operation or dehumidification cooling operation automatically converted by diminishing the humidity own residents feel there was a problem that can only be efficient dehumidification jeohal. 물론, 습도가 30% 이하인 경우에는 별 문제가 없겠으나 대략 80% 이상이 될 경우에는 쾌적한 실내환경이 되지 않을 뿐만 아니라, 실내에 있는 음식물이 부패할 우려가 있어 이와같은 문제점의 개선 필요성이 대두되어 왔던 것이다. Of course, as well as the humidity is not more than 30 percent, but eopget a problem is not a pleasant indoor environment, when more than about 80%, there is a risk that the food in the interior of corruption have emerged the need to improve the above problems It will come. 따라서, 본 발명은 상기와 같은 여러가지 문제점을 감안하여 이루어진 것으로써, 본 발명의 목적은, 실외온도 및 실외온도 변화폭을 일정시간 동안 감지하여 습도 및 날씨 등의 기후를 판별하고 그에따른 적절한 제습운전이 자동적으로 수행되도록 하는 분리형 에어 컨디셔너의 자동제어방법을 제공하는데 있다. Accordingly, the present invention is written been made in view of the various problems as described above, an object of the present invention, by sensing the outdoor temperature and the outdoor temperature variation for a certain period of time to determine the weather such as humidity and weather suitable dehumidifying operation accordingly automatically to provide automatic control method of the separate type air conditioner to be performed by. 본 발명의 다른 목적은, 일반적인 습도센서에 의해 감지가 불가능한 범위의 습도변화폭은 일정시간동안 감지된 실외온도를 기준으로 마이크로컴퓨터에 설정 되어 있는 습도의 범위로 판정보정토록 하여 그에따른 제습운전을 수행하는 분리형 에어컨디셔너의 자동제어방법을 제공하는데 있다. The ever another object of the present invention, the general humidity humidity variation range of the non-range detected by the sensor is determined in a range of humidity is set in the microcomputer based on the outdoor temperature is detected for a predetermined time compensation performing a dehumidifying operation accordingly automatic control method of the separate type air conditioner which is to provide a. 본 발명의 또 다른 목적은, 저온에서의 제습운전이 일정시간 이상 계속될 경우에는 실내 열 교환기의 동결을 방지하도록 제어되는 분리형 에어컨디셔너의 자동 제어방법을 제공하는데 있다. If a further object of the present invention is a dehumidification operation at a low temperature will continue over a period of time, there is to provide an automatic control method of the separate type air-conditioner is controlled to prevent freezing of the indoor heat exchanger. 상기 목적을 달성하기 위하여 본 발명에 의한 분리형 에어컨디셔너의 자동제어 방법은, 일정 시간동안 감지된 실외온도를 마이크로 컴퓨터의 메모리에 저장하는 제 1 스텝과, 상기 메모리에 저장된 일정시간 전의 온도와 일정시간동안 감지된 현재 온도를 비교하는 제 2 스텝과, 상기 제 2 스텝에서 비교된 온도를 토대로 실외온도 변화폭을 판별하는 제 3 스텝과 상기 제 3 스텝에서 판별된 실외온도변화폭을 토대로 마이크로컴퓨터에 기억된 실외온도의 범위와 부합되는 지를 판별하는 제 4 스텝과, 상기 제 3 스텝 및 제 4 스텝에서 판별된 실외온도 변화폭과 실외온도 범위가 부합될 경우 상대습도값을 적절하게 보정한 후 마이크로컴퓨터의 제어에 의해 적합한 제습 운전을 수행하는 제 5 스텝과, 상기 제 5 스텝의 제습운전이 장시간 계속될 경우 발생되 Automatic control method of the separate type air-conditioner according to the present invention in order to achieve the above object, for a period of time that the outside temperature of the first step, the temperature and a predetermined time before stored in a certain period of time in the memory for storing the microcomputer memory detected for a and the second step for comparing the current temperature detected, wherein the second outdoor storage on the basis of the outdoor temperature variation range determined in the second step and the third step of determining the outdoor temperature variation range based on the temperature comparison in step to the microcomputer a fourth step, the third step and the fourth step the outdoor temperature variation and control of the after appropriately correcting the relative humidity value of the microcomputer when the outdoor temperature range to match determination in the determination whether to be consistent with the range of the temperature if the fifth step, the dehumidifying operation of the fifth step of performing a suitable dehumidifying operation by the to continue a long time balsaengdoe 는 실내열교환기의 동결을 방지하기 위해 일정시간 동안의 실외온도를 판별하는 제 6 스텝과 상기 제 6 스텝의 판별결과, 실외온도 및 제습운전 지속시간이 마이크로컴퓨터 내의 동결방지 기준데이타에 부하될 경우 일반 자동운전으로 복귀하는 제 7 스텝으로 이루어진 것을 특징으로 한다. Is if the sixth step and the sixth step the result of the check, the outdoor temperature and the dehumidification operation duration to determine the outdoor temperature for a certain time the load on the freezing reference data in the microcomputer in order to prevent freezing in the indoor heat exchanger It characterized by comprising a seventh step of returning to the normal automatic operation. 이하, 본 발명의 일실시예를 도면을 참조하여 상세히 설명한다. With reference to the figures of one embodiment of the present invention will be described in detail. 제 2 도는 본 발명이 적용되는 분리형 에어컨디셔너의 전체적인 개략도이고, 제 3 도는 본 발명을 구형하기 위한 제어 시스템도 이며, 제 4 도는 습도 및 실외온도를 대비한 그래프이다. The second is the present invention, the overall schematic diagram of a separate type air conditioner that is applied to turn and the third turn is also a control system for the present invention spherical, the fourth turn is a graph compared to the humidity and the outdoor temperature. 제 2 도 및 제 3 도에 있어서, (1)은 본 발명에 의한 제습운전을 총괄적으로 제어하는 마이크로컴퓨터이고, (2)는 냉방운전시 실내열교환기(도시하지 않음)에 흡입되는 공기의 온도 즉, 실내의 온도를 감지하여 마이크로컴류터(1)에 입력하는 실내온도검지센서이며, (3)은 본 발명의 주 목적인 실외온도에 따른 적합한 제습운전이 가능토록 실외의 온도를 감지하여 마이크로컴퓨터(1)에 입력하는 실외온도 검지센서이다. In the second road and FIG. 3, (1) is a microcomputer which collectively controls the dehumidification operation according to the present invention, (2) the temperature of the air sucked into the indoor heat exchanger during the cooling operation (not shown) that is, the room temperature detecting sensor for sensing the temperature of the indoor type micro Com ryuteo (1) and (3) is ever possible suitable dehumidifying operation in accordance with the primary purpose of the outdoor temperature of the present invention to sense the outdoor temperature of the microcomputer an outdoor temperature sensor for detecting the input (1). 또한, (4)는 실내의 습도를 일정시간 동안 감지하여 마이크로컴퓨터(1)에 입력하는 습도센서이고, (6)은 상기 마이크로 컴퓨터(1)의 제어를 받아서 실내모터(8)의 구동을 제어하는 실내드라이버이며, (7)은 상기 마이크로컴퓨터(1)의 제어를 받아서 실외모터(9)와 실내온도 상승 또는 하강의 필요성에 따라 제어되는 콤프레셔(10)의 구동을 제어하는 실외 드라이버이다. Further, (4) is a humidity sensor that detects the humidity in the room for a period of time input to the microcomputer (1), (6) controls the driving of the indoor motor 8 receives the control of the microcomputer 1 the interior of the driver, 7 is a driver for controlling the driving of the outdoor compressor 10 is controlled according to the needs of the outdoor motor 9 and the indoor temperature (rising or falling) receives the control of the microcomputer (1). 한편, 미 설명부호 5는 실내열교환기 온도검지센서이고, 실내온도 검지센서(2)와 습도센서(4)는 제 2 도에 도시한 바와같이 벽(w)을 중심으로 실내에 설치되는 에어컨디셔너 몸체(100)의 전면 우측부에 상·하로 부착되며 실외온도검지센서(3)는 실외에 설치되는 에어컨디셔너의 보조 몸체(200)의 일정부위에 부착되어 실외온도감지가 가능토록 한다. On the other hand, reference numeral 5 is a temperature detection sensor indoor heat exchanger, a room temperature detecting sensor (2) and the humidity sensor 4 is the air conditioner body, which is installed in the room around the wall (w) as shown in FIG. 2 100 and the front attachment up and down the upper and the right-side portion of the outdoor temperature detecting sensor 3 is attached to the constant region of the auxiliary body 200 of the air conditioner is installed outdoors and the outdoor temperature detected ever possible. 이와 같이, 구성되어 있는 본 발명에 의한 분리형 에어컨디셔너의 자동제어방법은, 실내온도검지센서(2), 실내열교환기 온도검지센서(5) 및 습도센서(4)의 감지값이 마이크로 컴퓨터(1)에 입력되는 한편으로, 실외 온도검지센서(3)에 의해 일정시간 동안 감지된 실외온도(외기온도) 값이 마이크로컴퓨터(1)에 입력되어 실외온도에 따른 상대습도를 판단보정한 후 그에 따른 적절한 제습운전을 수행함과 동시에 실내열교환기의 동결을 방지토록 하는 프로그램을 수행하는 것이다. Thus, the automatic control method of the separate type air-conditioner according to the present invention is configured, the detection value of the room temperature detecting sensor (2), an indoor heat exchanger temperature detection sensor 5 and the humidity sensor 4, the microcomputer 1 input to the other hand, the outdoor temperature detecting sensor 3 to the outdoor temperature (outside temperature) is detected, for a predetermined time by this is inputted to the microcomputer (1) proper hence after determining correct the relative humidity of the outside temperature at the same time that the dehumidifying operation is to run the program ever to prevent freezing of the indoor heat exchanger. 상기와 같은 동작은 마이크로컴퓨터(1)에 저장된 기준 데이타 및 프로그램에 따라 가능하다. Operation as described above is possible according to the criteria data and programs stored in the microcomputer (1). 즉, 여름철의 온도 대 습도는 대체로 맑은 날은 외기온도가 고온인 반면 습도는 상대적으로 낮고, 흐리거나 비 또는 소나기가 오는날은 외기온도는 저온이 반면 습도는 상대적으로 높다는 것을 참고로 하여 표과 같은 기준 데이타를 만드는 것이며, 상기 기준데이타를 마이크로컴퓨터(1)내의 기억장치에 저장시켜서 제습운전을 수행하기 위한 기준판별 데이타로 이용하는 것이다. That is, the temperature humidity in summer is generally a clear day is to note that outside temperature is high temperature, while the humidity is relatively low, light or the outside temperature is low temperature, while humidity is high relative date when the rain or shower coming Table [ 1 and will make reference to the same data, and to use the reference data to determine the reference data for performing the dehumidifying operation by storing in the storage device in the microcomputer (1). 이때, 습도가 80%이상이 될 경우에는, 습도센서(4)의 감지변화폭이 거의 없으므로 판별된 실외온도와 그 변화폭 유지시간을 기준으로 상대습도를 설정하여 적절한 제습운전이 수행되도록 한다. At this time, such that if the humidity is 80% or more is, by setting the relative humidity based on the outdoor temperature and the holding time of the variation is substantially not detected determine the variation of the humidity sensor 4 to perform a proper dehumidification operation. 또한 본 발명에서는 저온에서의 장시간 제습운전으로 인해 발생될 수 있는 실내 열교환기의 동결을 방지하기 위하여 여러가지 동결방지 기준 데이타를 이용한다. Also use a variety of antifreeze based on the data in order to prevent the freezing of the indoor, which may occur due to the long time heat dehumidification operation at a low temperature in the present invention. 즉, 실외온도 및 제습운전 수행시간이 단계별로 설정되어 있는 것이다. That is, the outdoor temperature and the dehumidifying operation will be performed the time that is set in steps. 일례로써 실외온도가 23℃ 이하에서 일정시간 동안 제습운전이 연속으로 수행되면 일반 자동운전으로 변환시켜 실내열교환기의 온도가 더이상 하강하지 않도록 하고, 실외온도가 25℃ 이하에서 제습운전이 연속적으로 일정시간 단위로 경과하면 일정시간을 지연시킨후 재차 제습운전을 수행토록하며, 상기 제습운전은 실내의 습도가 60% 이상일 경우에만 수행되도록하며, 실내의 습도가 40% 이하일 경우에는 수행되지 않도록 한다. When the outdoor temperature is the dehumidifying operation for a certain period of time less than 23 ℃ way of example carried out in a continuous and converts to normal automatic operation so as not the temperature of the indoor heat exchangers fall any more, and the outdoor temperature is dehumidification operation is continuously constant at less than 25 ℃ If elapsed (in hours), and ever performs a dehumidification operation again after a delay for a predetermined time, the dehumidification operation shall be performed only when the humidity in the room 60% or more, is not performed when the humidity in the room 40% or less. 다음에, 제 5 도를 설명한다. Next, a fifth Fig. 제 5 도는 본 발명의 동작순서를 도시한 플로우챠트로서 동도면에 있어서, S는 스텝(단계)를 의미하여 제 2 도 내지 제 4 도와 연관하여 설명한다. The fifth turning in the figure as a flow chart showing an operation procedure of the present invention, S is described with FIG. 2 to 4 relate to help means a step (step). 먼저, 스텝 S 1 에서 본 발명의 제어장치에 전원을 온하면, 스텝 S 2 에서는 실외온도감지센서(3)에 의해서 일정시간 간격(T 1 )으로 실외온도가 감지되고, 스텝 S 3 에서는 상기 스텝 S 2 에서 감지된 실외온도를 마이크로컴퓨터(1)내의 메모리에 저장하며 이 동작을 일정횟수(예를 들어 3회)반복한다. First, when the ON power to the control device of the present invention in step S 1, the step S 2 in a certain time interval, the outdoor temperature (T 1) by the outside temperature sensor (3) is detected, in step S 3 the step storing the outdoor temperature detected by the S 2 to the memory in the microcomputer (1), and repeating this operation a certain number of times (e.g. three times). 즉, 표의 유지시간(D)까지도 커버될 수 있도록 수회 반복하는 것이다. That is, repeated several times so as to be covered until the holding time (D) of the table (1). 이어서 스텝 S 4 에서는 시간을 계속카운트하고, 스텝 S5에서는 상기 일정시간(T 1 )이 경과하였는지의 여부를 판별한다. Next, at step S 4, it continues to count time, and a step S5 discriminates whether or not the elapsed the predetermined time (T 1). 그 결과, 일정시간(T 1 )이 경과하지 않았을 경우(No일 경우)에는 스텝 S 4 의 카운트동작을 계속 수행하고, 일정시간(T 1 )이 경과하였을 경우(yes일 경우)에는 스텝S6로 나아가서 메모리에 기억되어 있는 일정시간(T 1 )전에 감지된 기온과 현재기온을 비교하여 스텝 S7에서 실외온도 변화폭(△t)이 △t 3 이내 인지의 여부를 판별한다. As a result, when a predetermined time (T 1) this has not elapsed (if No yl) When hayeoteul continue the counting operation of the step S 4, and the predetermined time (T 1) has elapsed (if yes days), to step S6 and further compares the air temperature with the current temperature detected before a predetermined time (t 1) which is stored in memory to determine whether or not the outdoor temperature variation (△ t) △ t is less than 3 in step S7. 그판별결과, 실외온도 변화폭(△t)이 △t 3 이내일 경우(yes일 경우)에는 표에 도시한 약 제습운전이 필요조건을 만족치 못하였으므로 일반운전을 수행하고, 그렇지 않을 경우(No일 경우)에는 스텝 S8로 나아가서 일정시간(t 2 )전 기온과 현재기온을 비교하여, 스텝 S9에서 실외온도 변화폭(△t)이 △t 3 이상인지의 여부를 판별한다. As a determination result, when the outdoor temperature variation (△ t) is △ t within three (if yes yl) has hayeoteumeuro nail value satisfies approximately the dehumidification operation the requirements shown in Table 1 performs a normal operation, otherwise if (if No days), as compared to a further predetermined period of time (t 2) around the temperature and the current temperature in step S8, it is determined whether or not the outdoor temperature variation (△ t) is △ t 3 or more in step S9. 상기 판별 결과, 실외온도 변화폭(△t)이 △t 3 이상일 경우(yes 일 경우)에는 스텝 S70에서 일반운전을 수행하고, 실외온도변화폭(△t)이 △t 3 이상이 아닐 경우(No일 경우)에는 스텝 S10에서 일정시간(T 3 )전 기온과 현재 기온을 비교하여 스텝 S11에서 실외온도 변화폭(△t)이 △t 3 이상인지의 여부를 판별하여 △t 3 이상일 경우(yes일 경우)에는 역시 표의 조건을 만족치 못하였으므로 스텝 S110에서 일반운전을 수행하고 △t 3 이내일 경우(No일 경우)에는 표의 조건을 만족하였으므로(실외온도변화폭(△t)이 △t 3 이내이면서 유지시간이 D시간이상)날씨는 장마 또는 안개낀 날로 판정하고, 스텝 S12에서 실외온도가 15~28℃의 범위인지의 여부를 판별한다. The determination result, if the outdoor temperature variation (△ t) is △ t 3 or more (if yes days), if not performing normal operation in step S70, and the outdoor temperature variation (△ t) is △ t over 3 (No one case) in the case where the predetermined time (t 3) around the temperature and if present comparing the temperature to △ to determine whether or not the outdoor temperature variation (△ t) is △ t 3 or more in step S11 t 3 or higher (yes at step S10 ) has also hayeoteumeuro nail value satisfies the conditions shown in Table 1 performs a normal operation in step S110, and △ t 3 If (No case within yl) has hayeoteumeuro satisfy the conditions of Table 1 (outside temperature variation (△ t ) a △ t 3, yet within the holding time is more than the time D) is checked weather the rainy or foggy day, and determines whether or not the outdoor temperature range of 15 ~ 28 ℃ in step S12. 상기 판별 결과, 실외온도가 15℃-28℃범위 이상일 경우(No일 경우)에는 상기 실외온도변화폭 (△t 3 )은 만족하나 실외온도범위는 만족치 못하므로 약 제습운전이 필요치 않다고 판단하여 스텝 S110의 일반운전을 수행하고, 실외온도가 15℃~28℃범위일 경우(yes일 경우)에는 스텝 S13으로 나아가서 습도센서(4)로 부터 입력되는 실내습도가 85% 이하인지를 판별한다. The determination result, if the outdoor temperature is more than 15 ℃ -28 ℃ range (if No days), because the outdoor temperature variation (△ t 3) is one satisfying the outdoor temperature value is not satisfied and determines that the dehumidifying operation is required about the step It performs an operation of S110, and if the outdoor temperature is 15 ℃ ~ 28 ℃ range (if yes days), it is determined whether the indoor humidity inputted from the program proceeds to a step S13, the humidity sensor 4 to 85%. 그 결과, 실내습도가 습도센서(4)가 정확하게 감지하기 곤란한 범위인 설정값 이하(에를들어 80%)일 경우(yes일 경우)에는 스텝 S14로 나아가서 마이크로컴퓨터(1)내에서 습도센서(4) 입력값을 85%로 보정한후 스텝 S15의 콤프레셔(10)구동 및 실내팬 속도를 최저 또는 정지 하는 약 제습운전을 수행한다. As a result, when the indoor humidity and the humidity sensor 4 is less than the range of set value is difficult to accurately detect (e. G. 80%) (if yes yl) has a humidity sensor within the program proceeds to a step S14 the microcomputer (1) (4 ), the compressor 10 is driven and the indoor fan speed after adjusting the input value of 85% step S15 performs the dehumidification operation to about the minimum or stopped. 한편, 상기 스텝 S13의 실내습도 판별결과, 실내습도가 85% 이상일 경우(No일 경우)에는 보정할 필요가 없으므로 직접 스텝 S15로 나아가서 표 1의 조건에 일치하는 약 제습운전을 수행한다. On the other hand, it performs the dehumidification operation to approximately determine when the ambient humidity of the step S13 results, that is more than 85% room humidity (if No one), since there is no need to correct the program proceeds to a step S15 directly corresponds to the conditions shown in Table 1. 본 발명은 실내열 교화기의 동결을 방지하는 것도 목적이므로 스텝 S16에서는 실외온도가 동결 방지 기준온도인 25℃이하인지의 여부를 판별하며 25℃이상일 경우(No일 경우)에는 동결방지 기준데이타에 부합되지 않으므로 직접 스텝 S21으로 나아가서 실내습도가 50% 이상인지를 판별한다. To the invention (in case of No) it is also the purpose because it is in the step S16, and determines whether or not the outdoor temperature is the freezing reference temperature is below 25 ℃ case 25 ℃ or more to prevent freezing in the indoor heat rehabilitated has anti-freezing reference data does not conform directly proceeds to a step S21 and determines whether the indoor humidity is 50% or more. 그 판별결과, 실내습도가 50% 이상일 경우(yes일 경우)에는 제습운전이 계속수행되어야 하므로 스텝 S16로 복귀하고, 실내습도가 505 이하일 경우(No일 경우)에는 제습운전 수행이 필요치않다고 판단하여 스텝 S25의 일반운전을 수행하며, 상기 스텝 S16의 판별결과, 실외운도가 25℃이하일 경우(yes일 경우)에는 스텝S17으로 나아가서 실외온도가 더욱 낮은 동결방지 기준온도인 23℃ 이하가 되었는지의 여부를 판별한다. As a determination result, when the indoor humidity is 50% (if yes days), because it must be performed to continue the dehumidifying operation and is returned to the step S16, when the indoor humidity is 505 or less (when No days), to determine that required to perform the dehumidification operation case and performs an operation of step S25, the determination result in the step S16, the outdoor luck is 25 ℃ or less (if yes days), whether or not the not more than 23 ℃ and further the outdoor temperature is prevented reference temperature lower freezing to step S17 to be determined. 상기 판별 결과, 실외온도가 23℃이하일 경우(yes일 경우)에는 저온에서의 제습운전이므로 스텝 S18로 나아가서 시간 카운트를 수행하여 스텝 S19에서 일정시간 경과 여부를 판별하며, 일정시간이 경과하였을경우(yes일 경우)에는 실내 열교환기 동결방지 기준 데이타에 부합되었으므로 스텝 S20의 일정시간지연후 스텝 S21의 실내습도 판별동작을 수행하며, 스텝 S19에서 일정시간이 채 경과하지 않았을 경우(No일 경우)에는 스텝 S18로 복귀하여 일정시간이 경과하는지의 여부를 확인하기 위하여 시간 카운트를 수행한다. The determination result, when the outdoor temperature is 23 ℃ or less (if yes days), because the dehumidification operation at a low temperature, and by performing a time counting program proceeds to a step S18 to determine the predetermined time if in step S19, To obtain specific predetermined time ( If yes days) in the case where the case after a predetermined time delay in step S20, and performs the indoor humidity determination operation of step S21, a certain period of time in step S19 has not elapsed holding been consistent with the anti-freezing the indoor heat exchanger based on the data (no), the process returns to step S18 and performs time counting to determine whether or not a certain period of time. 한편, 상기 스텝 S17에서 실외온도가 23℃ 이상일 경우(No일 경우)에는 실외온도가 25℃ 이하이면선 23℃ 이상이므로 동결방지 기준데이타에 비교하기 위하여 스텝 S22에서 시간 카운트를 수행하며 스텝 S23에서는 일정시간 경과 여부를 판별한다. On the other hand, the case the step in S17 the outdoor temperature 23 ℃ or more (if No days), and perform the time counting in step S22 to compare the anti-freeze because the outdoor temperature is more than is 23 ℃ line below 25 ℃ reference data in Step S23 it is determined whether a predetermined time has elapsed. 그 판별 결과, 일정시간이 채 경과하지 않았을 경우(No일 경우)에는 스텝 S16으로 복귀하여 차후의 동작(동결방지 기준온도 판별동작)을 재차 반복하고, 일정시간이 경과하였을 경우(yes일 경우)에는 실내열교환기 동결방지 기준데이타에 부합되었으므로 스텝 S24로 나아가서 일정시간 제습운전을 지연시킨 후 재 제습운전을 수행하면서 스텝 S16로 복귀하여 차후의 동작을 반복 수행한다. If the determination result, a certain amount of time has not elapsed without (if No yl) When hayeoteul returns to step S16 to again repeat the subsequent operation (freezing reference temperature determination operation), and a certain time (if yes yl) is repeatedly performs the subsequent operations of the process returns to step S16, while performing the dehumidifying operation again after a certain time delay and further dehumidifying operation to step S24 because the match in the indoor heat exchanger prevent freezing reference data. 상기 제 5 도의 플루우 챠트는 표의 조건중 상대습도 85% 이상의 약 제습운전에 대해서만 설명하였으나, 상대 습도 75% 이상의 약 제습운전 및 상대습도 90% 이상의 중 제습운전에 대해서도 마찬가지의 방법으로 수행됨은 물론이다. Fluorenyl right chart five degrees wherein the table (1) condition has been described only for about dehumidifying operation relative humidity greater than 85% of the method of the same applies to about dehumidifying operation relative humidity of 75% or more and a relative humidity of the dehumidifying operation of more than 90% performed with as a matter of course. 다만, 상대습도 75% 이상의 약 제습운전의 경우에는, 실외온도변화폭(온도차 : △t)이 △t 3 이내이면서 유지시간이 E시간 이상이므로 스텝 S2의 실외온도감지와 스텝 S3의 메모리 저장 동작은 2회이며 T 2 시간전 기온과 현재 기온의 비교결과 실외온도변화폭(△t)이 △t 2 이상이 아닐 경우 스텝 S12 이후의 동작을 마찬가지 방법으로 수행한다. However, when the relative humidity of 75% or more about the dehumidifying operation, the outdoor temperature variation (temperature difference: △ t) is △ t 3 within, yet holding time it is E times or more because the outdoor temperature is detected and the memory operation of the step S3 in the step S2 twice, and performs the temperature T 2 hours ago to the operation of step S12 is not the case since the comparison result outside temperature variation (△ t) △ t is at least 2 of the current temperature in the same manner. 또한, 상대습도 90% 이상의 중 제습운전의 경우에는 실외온도변화폭(온도차 : △t)이 △t 1 이내이면서 유지시간이 F시간 이상이므로 스텝 S2의 실외온도검지와 스텝 S3의 메로리 저장 동작으 1회로 충분하며 T 1 시간전 기온과 현재기온의 비교결과 온도차(△t)가 △t 1 상이 아닐 경우 스텝 S11이후의 동작을 수행하면 되는 것이다. Further, when the relative humidity of the dehumidifying of more than 90% of operation, the outdoor temperature variation (temperature difference: △ t) is △ t 1 within while the holding time is F times or more because it is merori storage operation at the step S2 the outdoor temperature detector and the step S3 of the lead 1 circuit sufficient and t 1 hour ago temperature and compare the result of the current temperature temperature (△ t) is not 1, when △ t is different from that when performing the operation of step S11 thereafter. 이와 같이 본 발명의 분리형 에어컨디셔너의 자동제어 방법에 의하면, 감지된 실외온도를 기준으로 상대습도를 판정하여 그에 따른 적절한 제습운전이 수행되도록 함으로서 쾌적한 환경을 이루고 또한, 장치의 동결를 방지하여 경제적 손실을 줄이는 커다란 효과가 있다. 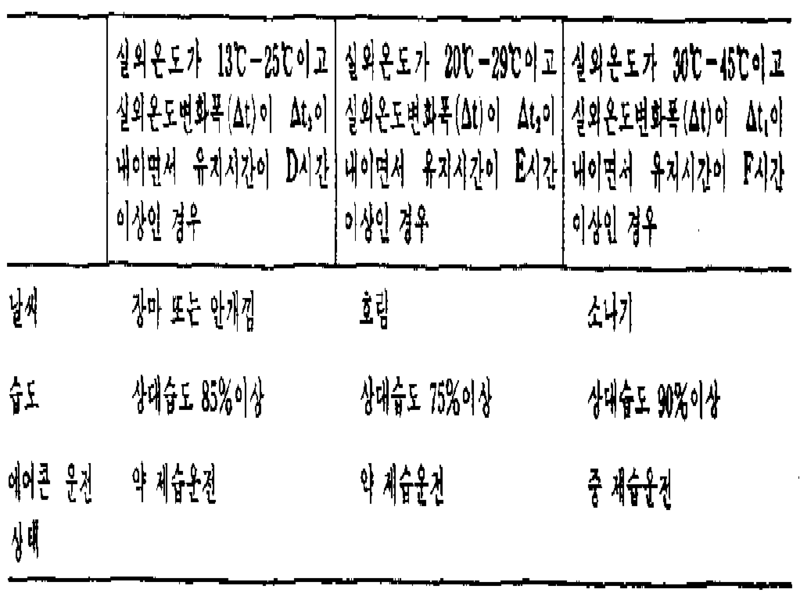 Thus, according to the automatic control method of the separate type air-conditioner of the present invention, to determine the relative humidity based on the detected outdoor temperature forms a comfortable environment by to perform the appropriate dehumidifying operation, hence also, to reduce the economic losses to prevent donggyeolreul of device there is a big effect. 일정 시간동안 감지된 실외온도를 마이크로컴퓨터의 메모리에 저장하는 제 1 스텝과, 상기 메모리에 저장된 일정시간 전의 온도와 일정시간동안 감지된 현재온도를 비교하는 제 2 스텝과, 상기 제 2 스텝에서 비교된 온도를 토대로 실외온도변화폭을 판별하는 제 3 스텝과, 상기 제 3 스텝에서 판별된 실외온도변화폭을 토대로 마이크로컴퓨터에 기억된 실외온도의 범위와 부합되는지를 판별하는 제 4 스텝과, 상기 제 3 스텝 및 제 4 스텝에서 판별된 실외온도변화폭과 실외온도 범위가 부합될 경우 상대습도값을 적절하게 보정한 후 마이크로컴퓨터의 제어에 의해 적합한 제습 운전을 수행하는 제 5 스텝과, 상기 제 5 스텝의 제습운전이 장시간 계속될 경우 발생되는 실내열 교환기의 동결을 방지하기 위해 일정시간 동안의 실외온도를 판별하는 제 6 스텝 The outdoor temperature is detected for a predetermined time a first step of storing in the microcontroller memory, the second step for comparing the current temperature detected during said memory temperature and a predetermined time before stored in a certain period of time on, a comparison in the second step the third the third step and the fourth step, which determines whether or not the first in line with the scope of the outdoor temperature storage on the basis of the outdoor temperature variation range determined in the third step to the microcomputer to determine the outdoor temperature variation range based on the temperature a fifth step of the fifth step to perform the step and the fourth step the outdoor temperature variation and if the outdoor temperature range consistent with the relative humidity value suitable dehumidifying operation by the control of the microcomputer and then properly calibrated to determine in a sixth step of determining the outdoor temperature for a period of time in order to prevent freezing of the indoor heat exchanger occurs when the dehumidifying operation is continued for a long time 과, 상기 제6스텝의 판별 결과, 실외온도 및 제습운전 지속시간이 마이크로컴퓨터 내의 기준데이타에 부합될 경우 일반 자동운전으로 복귀하는 제 7 스텝으로 이루어진 것을 특징으로 하는 분리형 에어컨디셔너의 자동제어방법. And a method for automatically controlling the air conditioner of separate type according to a result of the analysis in a sixth step, if the outdoor temperature and the dehumidification operation duration is consistent with the reference data in the microcomputer characterized by being a seventh step of returning to the normal automatic operation. 제 1 항에 있어서, 상기 마이크로컴퓨터에는 실외온도를 기준으로 날씨 판정을 하는 프로그램이 내장되어 있는 것을 특징으로 하는 분리형 에어컨디셔너의 자동제어방법. The method of claim 1, wherein automatic control of a separate type air conditioner which is characterized in that a built-in program that the weather is determined based on the micro-computer, the outdoor temperature. 제 1 항에 있어서, 상기 제 5 스텝에서 실외온도변화폭과 온도범위가 일치하지 않을 경우에는 제습운전이 아니라고 판단하여 일반 운전을 수행하는 것을 특징으로 하는 분리형 에어컨디셔너의 자동제어방법. The method of claim 1, wherein automatic control of a separate type air conditioner which is characterized in that when in the fifth step the outdoor temperature variation and temperature do not match, it is determined not the dehumidifying operation is performed for normal operation. 제 1 항에 있어서, 상기 제 7 스텝의 실외온도 및 제습운전지속 시간이 마이크로컴퓨터내의 기준데이타에 부합되지 않을 경우에는 계속 실외온도와 시간 체크를 반복하는 것을 특징으로 하는 분리형 에어컨디셔너의 자동제어방법. The method automatically control the separate air-conditioner which comprises the outdoor temperature and the dehumidification operation the duration of the seventh step repeat is continued outside temperature and time check if it is not consistent with the reference data in the microcomputer according to claim 1. 제 1 항에 있어서, 상기 제 5 스텝의 실외온도변화폭과 실외온도 범위가 부합될 경우에는 설정된 상대습도로 인식하여 해당하는 제습운전을 수행하는 것을 특징으로 하는 분리형 에어컨디셔너의 자동제어방법. The method of claim 1, wherein automatic control of the separate type air-conditioner, characterized in that performing a dehumidifying operation corresponding to when the outdoor temperature and the outdoor temperature variation range of the fifth step meets recognized at a relative humidity set. 제 1 항에 있어서, 상기 제 1 스텝의 실외온도는 보조몸체에 부착된 실외온도검지센서에 의해 감지되는 것을 특징으로 하는 분리형 에어컨디셔너의 자동제어방법. The method of claim 1, wherein the outside temperature of the first step is automatic control method of the separate type air-conditioner, characterized in that sensed by the outdoor temperature detecting sensor attached to the secondary body.